It is a small bottle of 50 ml. Oil has a very modern packaging, decorated in elegant, neutral colours (only black and white colours). The bottle is bulky and transparent, through its wall you can clearly see colourless, oily cosmetic. 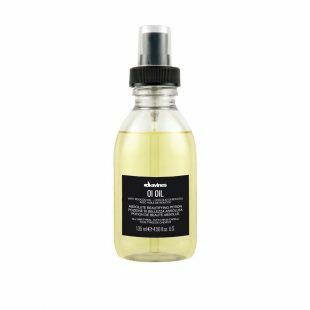 Davines Oi Oil is equipped with a small, black pump, which works flawlessly. It has a delicate and sweet scent, a bit like the smell of hair styling lotions. It is pleasant and non-irritating. Such oil is a combination of natural hair care oils with innovative, created in Davines laboratories, synthetic oils of new generation. This combination is intended to guarantee the effectiveness of Oi OIL Absolute Beautifying Potion. Oil was created primarily in order to quickly condition and beautify hair and protect it during treatments. Davines Oi Oil contains well composed natural oils: roucou oil and sunflower seed oil. The first one is a dense natural oil, which provides a wealth of beta-carotene. It protects hair against damage, deeply regenerates and nourishes it, and what is more – slows down the ageing process. Beta carotene is responsible for proper hair growth and slows down the effects of ageing. In addition, prevents breakage and hair loss. Ellagic acid included in the oil is responsible for beauty and youth of hair, which also prevents the loss of density within the fibres. Moreover, the cosmetic deeply regenerates hair and protects it from the outside. Thanks to this natural shielding provided by oil, your hair will be protected from harmful effects of weather conditions and against all kinds of styling treatments. They will become resilient, shiny and prone to styling. Sunflower seed oil provides a wealth of fatty acids from the omega – 6. It also prevents hair ageing, fights fragility and hair loss, perfectly conditions it. It provides hair with shine and resilience, leaving it soft and pleasant to the touch. There is a wealth of vitamin E called “vitamin of youth”. Such ingredient smooths hair and allows even the most dry and dull wisps to gain a beautiful appearance. Oi OIL Absolute Beautifying Potion makes styling hair very easy. It will be beneficial for all those who are usually in a rush in the morning and cannot afford time-consuming hairdos. Oil smooths hair and facilitates combing. It will add shine and strengthen the entire length. If you use the straightener in the morning – be sure to use hair oil first. As a result, you protect it against damage that can be caused by heat emitted by the straightener, curling iron or hair dryer. Oil from Davines brand also includes specially formulated, synthetic oils. They provide additional support for natural oils. They form a protective barrier around the hair. As a result, it is protected over the whole stem, and also reduces the drying time during the styling. Synthetic oils are also responsible for hair resilience and aim to protect its structure. Take two – three servings of the oil and apply on dry hair before styling. You can also apply a little bit of the product on hair directly after styling to strengthen it and add gloss. If you feel that your hair is losing condition and shine – you can use Davines oil even several times a day.